Renfaire After Dark weekend has come and gone and we admit… between 3 inches of rain leading up to it and the cold weather that night we weren’t really sure what to expect. Whatever we were expecting… the attendance, energy, and pure rambunctious fun blew us away! This rowdy good time will be happening again. We would love to hear your feedback to help us with planning for the future. 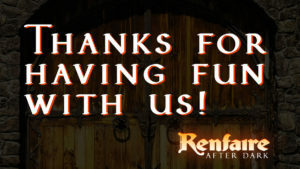 With this in mind we have created a new facebook page just for Renfaire After Dark. So please feel free to leave us a review on our page and tell us what you think we did well or what could use some improvement. For a first time event we know there are things that didn’t quite go how they should have or plans that didn’t work and your opinions are important to it being even better next time. Thanks for coming out, staying safe, and having fun!